Nighttime events are complemented by artists taking part in daytime talks, master classes, new technology showcases and forums. 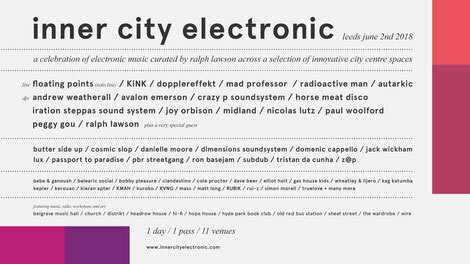 The collaborative event will involve 11 venues in Leeds, including Belgrave Music Hall, Church, Distrikt, Headrow House, Hope House, Hyde Park Book Club, Hi-Fi, Old Red Bus Station, Sheaf St, Wire, and The Wardrobe. The event has created by young local promoter Ben Thompson, curated by Ralph Lawson (20/20 Vision) and produced in collaboration with Ben Robinson (bluedot). inner city electronic will also apparently feature some of the best sound systems in the city including custom built rigs from Sub Dub and Cosmic Slop.